Q: I have a very old banknote that says "United States Note." The denomination is $1,000 and the date is 1840. What is it worth? A: The "note" you have is a fabrication issued as a promotional item in a cereal box some 30 to 35 years ago. It has no value. Q: I bought a 1916-D dime at a major auction some 30 years ago. I paid $350 for it. When I showed the coin to several dealers at a recent coin show, the valuations varied from $400 to $1,250 and four other prices in between. Why is there such a wide variation in offers? A: Dealers buy what they know they can readily sell for a profit  from 10 percent to maybe as much as 50 percent. The prices offered vary with each dealer's potential for a resale and a profit. You should be thankful that the coin was genuine, as too many 1916-D dimes are altered or counterfeit. Q: I have a 1952 cent from when I was in high school. It is shiny, like new. What is it worth? A: Depending on the color of the coin (which can vary from bright mint red to reddish brown) the value is about $1 to $2. 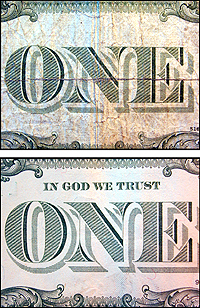 Q: I have several $1 bills without the motto, "In God We Trust," on the back. Are they worth anything over $1? A: The motto was added to all of our currency in the late 1960s. These "no motto" notes are worth face value, even in crisp, new condition. Q: Is the date on our paper money the year of issue? A: Not necessarily. The series date is when the particular series started, and may run for several years with the same series starting-date. Q: Is there a specialty library just for coin collectors? A: Yes. The largest one is at the American Numismatic Association headquarters in Colorado Springs. E-mail is library@money.org. There is also one at the American Numismatic Society in New York City. Q: I am collecting the new 50-state quarters and have every issue up to 2005. Are any of these coins scarce so far? A: From dealer's price lists, the Delaware quarter (the first one issued in 1999) is retailing for $1 in mint condition. All the others range from 50 cents to 75 cents. Since all were issued in quantities of hundreds of millions, none would qualify as "scarce." Q: When did the mint stop issuing silver coins? A: Silver coins for general circulation were last minted in 1964. From 1965 to 1970, Kennedy half dollars were minted in 40-percent silver. The dimes and quarters have been issued only in a copper-nickel alloy starting in 1965, and the halves since 1971. Special silver coins in proof sets were issued during the 1990s and sell for a premium, well above face value. These late-date silver coins are not meant for general circulation. By 1980 or so, 99.99 percent of all circulating silver coins had been removed from circulation, since they were worth as much as 25 times face value (in 1980). Today, pre-1965 silver coins are worth about five times face value. All nations that once issued silver coins also discontinued making silver coins in the 1960s (some earlier). Q: Is the U.S. dollar official currency in other countries? A: The U.S. dollar is the currency of Panama, and it co-circulates with local currencies in Bermuda, Liberia, Costa Rica, Ecuador and several other small nations. It is readily accepted in nearly all countries, although not as "official" currency. Q: I have a 1964 Lincoln cent with a small imprint of JFK on the front. Is this of any value? A: No. Anyone with a press and some die-making equipment can impress anything on coins  as long it is not an attempt to change the value of the coin. Q: I often see ads in the paper for a set of Lincoln cents or a group of Morgan dollars or a similar offering of coins. How do I know if this is worthwhile? A: Compare the offering with any coin dealer. These ads typically are priced far above the coins' current numismatic value. Q: I attend estate sales and police auctions. Every now and then, there are coin collections in the auction. Are they worth bidding on? A: Yes, they are. But if you are not well informed, you can get scorched. In a sale I attended some 25 years ago, a Hawaiian 1-cent token made around 1960 was sold for $140. It was presented in the auction as a "1847 Hawaiian One Cent piece." The real value is about 10 cents. (A genuine Hawaiian cent issued in 1847 is quite valuable.) In the same sale, I bought a large plastic bag filled with world currencies for $10. In it were current notes from Canada, Great Britain and Switzerland which I exchanged for more than $100. The rest I gave away to some kids.